With around a month left until Christmas arrives, All British Casino is about to start its yearly countdown with an amazing advent calendar. All British Casino will make the way to Christmas more fun than with amazing Christmas promotions for 25 consecutive days with Christmas Day as the last day. 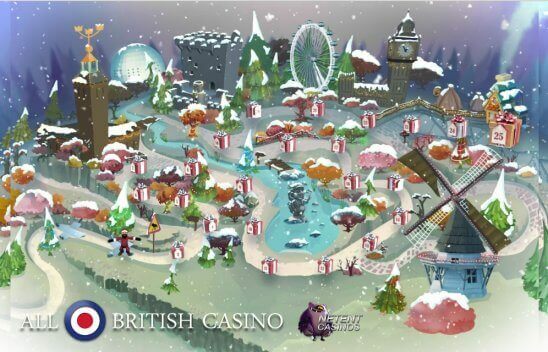 As usual, players can enjoy up to 999 bonus spins and lots of casino bonuses hidden in All British Casino’s Advent Calendar! 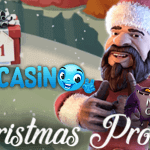 From the 1st of December, you must be ready to enjoy lots of Christmas greatness at All British Casino as it will be the first day of the Christmas countdown. During the countdown, an Advent calendar can be found on the website of this British online casino and each day until Christmas again, you can open the “window” with the date of day. For those who have no clue what traditional Advent calendar is about, you simply open “window” 1 on the 1st of December. 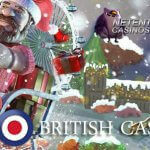 This will be next Saturday, the first day of a very long and attractive online casino promotion at All British Casino. From this day on, the Christmas countdown continues and on Sunday 2nd December, you’ll be able to open window 2. However, an online casino as All British doesn’t rely on paper so this particular Advent calendar will be automated. 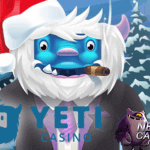 Just like all of you, I have to wait until Saturday to see what this online casino came up with exactly this year, but if it’s kind of the same as last year, we’ll be lucky to see Gonzo (Gonzo’s Quest™ slot), better known as The Gonz, dashing through the snow to get you to your next attractive Christmas promotion. The traditional Advent Calendar started on the Sunday nearest the feast day of St. Andrew the Apostle (November 30) through the following three Sundays. Advent seemed to derive from the Latin word for coming which could explain the name of this special calendar as Christmas is coming. Through history, the countdown to Christmas was a period for converts to Christianity to prepare for baptism. The tradition dates to the mid-19th century, when German Protestants made chalk marks on doors or lit candles to count the days leading up to Christmas. Nowadays, the Advent Calendar is associated with the anticipation of the anniversary of Christ’s birth on December 25 or simply with a calendar with surprise gifts or chocolates up for grabs on each day until Christmas. Modern Advent calendars hardly ever use the original period of Advent and instead the calendar starts on the 1st of December. Besides, there are many types like the online version at All British Casino, for example, although most Advent calendars are made from paper. 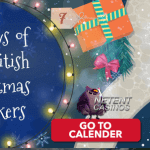 Until the 25th of December, Christmas Day, All British Casino is offering you a very charming digital Advent calendar hiding 25 Christmas promotions, one for each day. The best way to enjoy all 25 promotions is by making sure that you’ll become a player at All British Casino. Only this way, you know you don’t miss out on any promotion and you’ll be updated about all Christmas bonus gifts by All British Casino. You can also return to the Advent calendar every single day to see what’s going on. Some free spins offers are available for real-money players only while other free spins offers and casino bonuses are available to all players. A bonus life at All British Casino will be the best when you make a deposit once every few days. This way, you’ll be recognised as a real-money player and this will always lead to extra advantages when it comes to free spins bonuses. With over 999 Free Spins and a great number of reload bonuses, All British Casino’s Advent calendar should not be missed. That’s basically I can reveal for now as the nicest way to enjoy the Advent calendar is without knowing what’s coming, right. What’s the fun knowing what’s hidden behind window number 1 on the 1st of December. But I promise, there will be many casino bonuses, as well as free spins for video slots like Secrets of Christmas™, Gonzo’s Quest™, Flowers™ Christmas Edition and Flowers Christmas Edition™ as well as Hansel and Gretel™, Mirror Mirror™ and more. 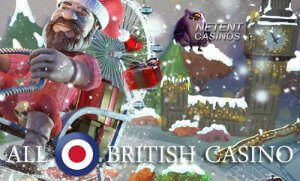 Soon it’s time to become all Christmassy so get your way to All British Casino and sign up today. You’ll also receive a very attractive welcome bonus offer including a 100% Deposit Bonus up to £100 plus 100 Free Spins for Starburst™, Aloha™, or Pyramid™.